Industrial Invention Revolution - Environmental Clean-up Idea? What kind of industrial invention revolution is this? Find more about environmental technology. With an industrial invention revolution ary thinkers have demonstrated significant changes in thinking. How? New things, services and such have made our industries more efficient than ever. Things such as making better products for a cheaper cost. And doing so with less impact on the environment. Is innovation always good? You would think so, but sometimes it isn't. Like when it gets into the hands of criminals. Or when the associate risks become too great for too many bystanders. But on the whole, inventiveness aims to increase our value and improve our quality of life all around. An new process, like the industrial invention revolution example below, serves as innovation put into action. Let's talk about the environment. We can now address highly problematic situations with unprecedented skill. What do you do with deeply contaminated soils and sludges? What if they contain PCBs, other chlorine containing poisons and dangerous hydrocarbons? A revolutionary industrial invention technology known as Thermal Phase Separation, and used by very few consulting environmental or technology firms can help with this difficult problem. The secret is to use energy heat transfer and cook it without combustion to prevent air contamination. This stimulates desorption, opposite of absorption, of the toxin and then it can be collected and disposed properly. The idea is a Canadian original. Service firms find it relatively easy to relocate and the cost is much lower relative to other means of cleanup. Have a look at this bit from the patent: An improved thermal phase separation unit separates contaminants from a contaminated substrate. 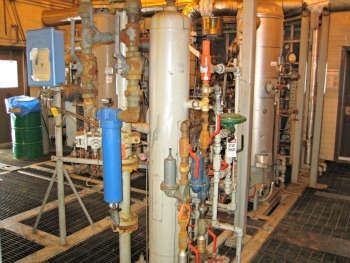 The improved thermal phase separation unit includes an enclosure arranged to withstand temperatures created by a combustion system, an essentially air-tight processing chamber supported within the enclosure by support columns connected between the processing chamber and a bottom of the enclosure, a heat shield disposed between the processing chamber and the bottom of the enclosure, and a vapor handling system arranged to remove vapor from the processing chamber. The combustion system heats the processing chamber, and, in turn, indirectly heats contaminated substrate being processed in the processing chamber so as to volatize contaminants in the contaminated substrate to vapor that is subsequently removed by the vapor handling system. Then see if you can find a company that uses this technology, such as Phase Separation Solutions Inc. in Calgary. See if it can start and industrial invention revolution in environmental design. You like this Idea? It works for its intended purpose, but probably is not perfect. Why not? Do you know of a better one? We'd all like to see it, I'll bet. A penny for your thoughts. Go ahead and type here! There's no registration or login required and nobody's watching...not yet. Send it here. Do you have a picture to add? Great! Click the button and find it on your computer. Then select it. Only .jpg's work here. Want to work in this kind of field? Find environmental science jobs through the Environmental Health & Safety Jobs webpage. Go back from Industrial Invention Revolution to the Stuff in the Air homepage.